Linnaeus named the genus Aesculus after the Roman name for an edible acorn. Common names for these trees include "buckeye" and "horse chestnut". Some are also called white chestnut or red chestnut. In Britain, they are sometimes called conker trees because of their link with the game of conkers, played with the seeds, also called conkers. Aesculus species have stout shoots with resinous, often sticky, buds; opposite, palmately divided leaves, often very large—to 65 cm (26 in) across in the Japanese horse chestnut Ae. turbinata. Species are deciduous or evergreen. Flowers are showy, insect- or bird-pollinated, with four or five petals fused into a lobed corolla tube, arranged in a panicle inflorescence. Flowering starts after 80–110 growing degree days. The fruit matures to a capsule, 2–5 cm (25⁄32–1 31⁄32 in) diameter, usually globose, containing one to three seeds (often erroneously called a nut) per capsule. Capsules containing more than one seed result in flatness on one side of the seeds. The point of attachment of the seed in the capsule (hilum) shows as a large circular whitish scar. The capsule epidermis has "spines" (botanically: prickles) in some species, while other capsules are warty or smooth. At maturity, the capsule splits into three sections to release the seeds. Native Americans used to crush the seeds and the resulting mash was thrown into still or sluggish waterbodies to stun or kill fish. They then boiled and drained (leached) the fish at least three times to dilute the toxin's effects. New shoots from the seeds also have been known to kill grazing cattle. The most familiar member of the genus worldwide is the common horse chestnut Aesculus hippocastanum. The yellow buckeye Aesculus flava (syn. A. octandra) is also a valuable ornamental tree with yellow flowers, but is less widely planted. Among the smaller species, the bottlebrush buckeye Aesculus parviflora also makes a very interesting and unusual flowering shrub. 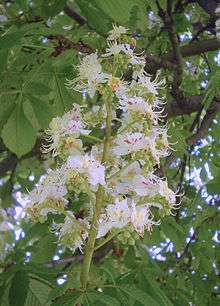 Several other members of the genus are used as ornamentals, and several horticultural hybrids have also been developed, most notably the red horse chestnut Aesculus × carnea, a hybrid between A. hippocastanum and A. pavia. 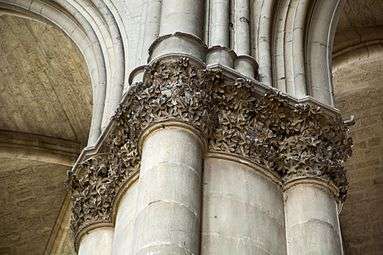 ↑ This designation has as a part of it a term, 'Tertiary', that is now discouraged as a formal geochronological unit by the International Commission on Stratigraphy. ↑ Ogg, J.G. ; Gradstein, F.M. ; Gradstein, F.M. (2004). A geologic time scale 2004. Cambridge, UK: Cambridge University Press. ISBN 0-521-78142-6. ↑ Harlan, Jack R. (1995). The Living Fields: Our Agricultural Heritage (1. publ. ed.). Cambridge [u.a. ]: Cambridge Univ. Press. p. 15. ISBN 0-521-40112-7. ↑ Akazawa, T.; Aikens, C.M. (1986). Prehistoric Hunter-Gathers in Japan. University of Tokyo Press. ↑ Aikens, C.M. ; Higachi, T. (1982). Prehistory of Japan. New York Academic Press. ↑ Hall, Alan (1976). The Wild Food Trail Guide (second ed.). New York: Holt, Rhinehart and Winston. p. 214. ↑ Peterson, Lee (1977). A field guide to edible wild plants of eastern and central North America. Boston: Houghton Mifflin Co. p. 172. 1 2 Nelson, Guy (2006). Ohio Buckeye (Aesculus glabra Willd. ), Plant Guide. Washington, D.C.: US Department of Agriculture, Natural Resources Conservation Service. ↑ Dale, Thomas R.; Scogin, Dixie B. (1988). 100 woody plants of Louisiana. Monroe, Louisiana: The Herbarium of Northeast Louisiana University. p. 118. ↑ Hardin, JW. 1957. A revision of the American Hippocastanaceae I. Brittonia 9:145-171. ↑ Judd, W.S. ; Sanders, R.W. ; Donoghue, M.J. (1994). "Angiosperm family pairs". Harvard Papers in Botany. 1: 1–51. ↑ Harrington, Mark G.; Edwards, Karen J.; Johnson, Sheila A.; Chase, Mark W.; Gadek, Paul A. (Apr–Jun 2005). "Phylogenetic inference in Sapindaceae sensu lato using plastid matK and rbcL DNA sequences". Systematic Botany. 30 (2): 366–382. doi:10.1600/0363644054223549. JSTOR 25064067. Forest, F., Drouin, J. N., Charest, R., Brouillet, L., & Bruneau A. (2001). A morphological phylogenetic analysis of Aesculus L. and Billia Peyr. (Sapindaceae). Canad. J. Botany 79 (2): 154-169. Abstract.